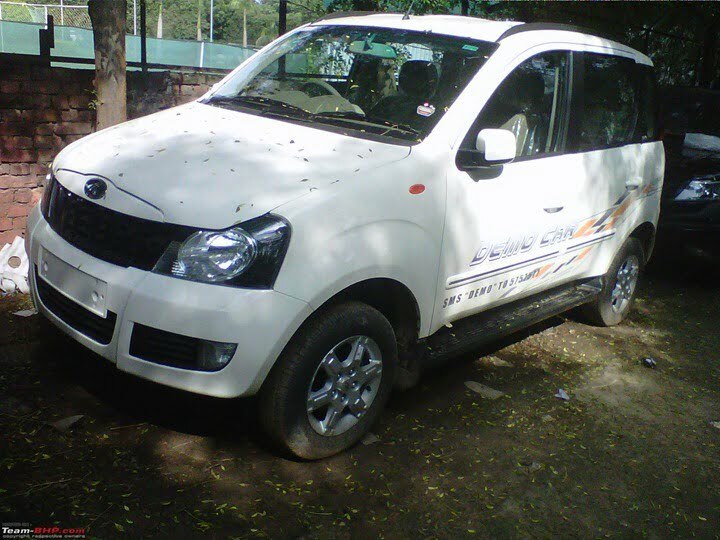 The car which has been spied is a demo car from a dealer’s stock-yard or some Mahindra premise. 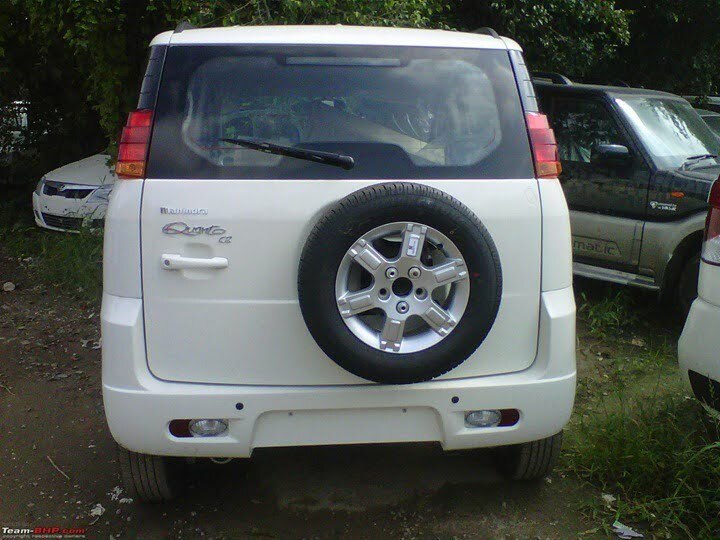 The car has large 15 inch fat wheels, aggressive front look just like the Xylo 2012 new model. 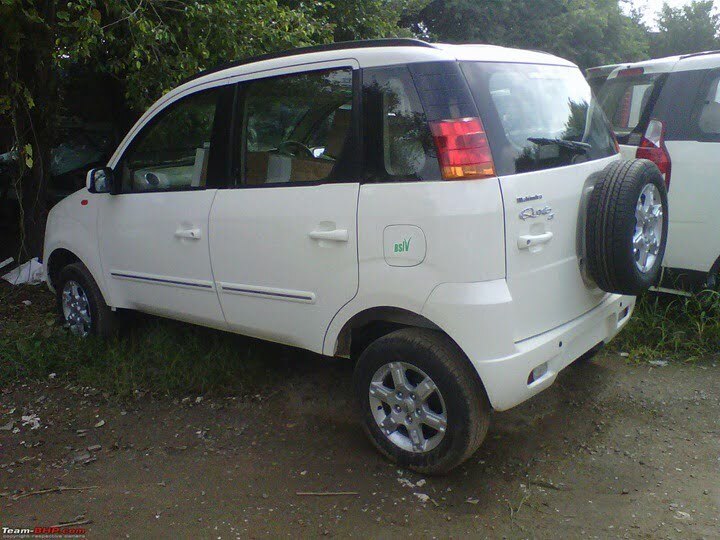 From the side profile, it looks like a smaller Xylo only with 2 row of seats with ample space on the interiors. There is a third row for luggage with two optional jump seats which can make it a 7 seater car. There is a spare wheel mounted on the rear with stylish cover which is not visible in these two shots of the non-demo car. The rear tail lamp cluster seems very stylish and chunky with wrap around to the sides. We must say that Mahindra has done a very good job with the rear styling of the Quanto making it look like a very appealing package. After the success of Mahindra Xylo MPV and Mahindra XUV500 SUV, Mahindra & Mahindra is working hard to make its upcoming compact SUV even a bigger hit. 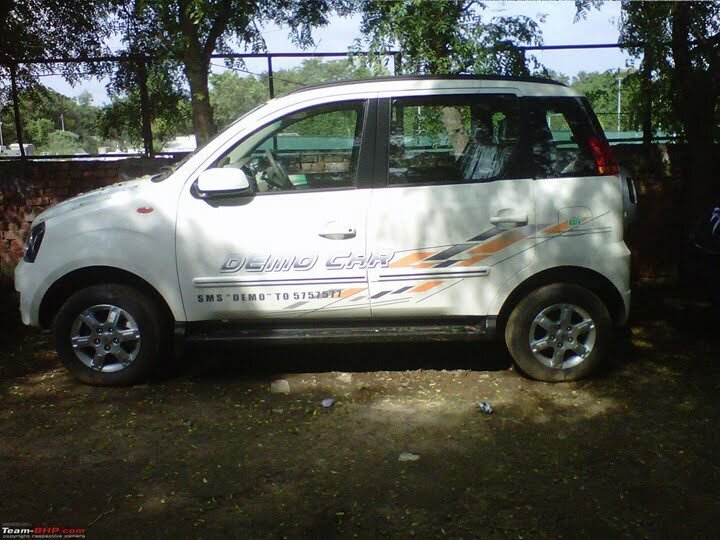 Yes we are talking about the yet to be launched Mahindra Quanto aka Xylo Mini which has been caught testing a couple of times in the previous months. The car maker is officially going to launch the Quanto on September 20, 2012 in Mumbai and we are eagerly waiting to see the action live on stage. The Quanto has been seen with layers of camouflage in the recent past but today we have a couple of pictures of the same where it does not have any camouflage at all. One of the Team-BHP members managed to catch this car while it was shooting for its TV commercial. 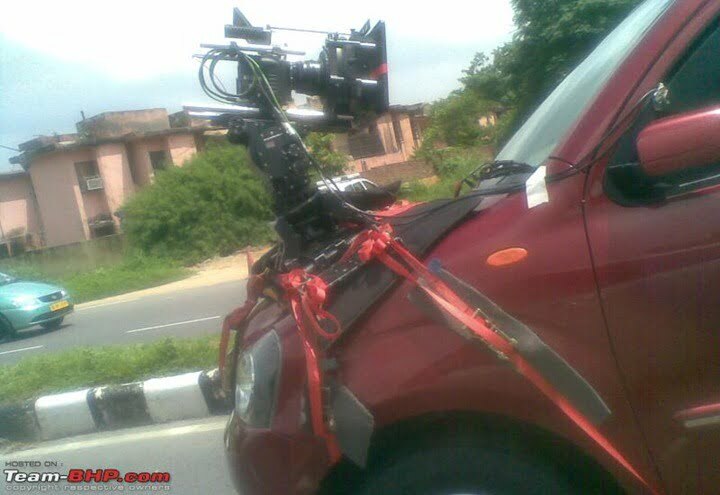 As you can see the camera set-up in the hood, it shows the car was out on the road for a TV commercial shoot but before it could get away. Talking about the car now, it is a sub 4 meter SUV which uses Mahindra Xylo’s underpinnings which are also present under the Genio pick up. For the engine part, speculations are there that a 1.5 litre, 3 cylinder, mCR100 engine will power the car. The same will deliver a maximum power output of 100 BHP and a peak power output of 240 Nm at 3750 RPM. Mileage figure will be close to 17 KMPL which is brilliant for a car of this size. 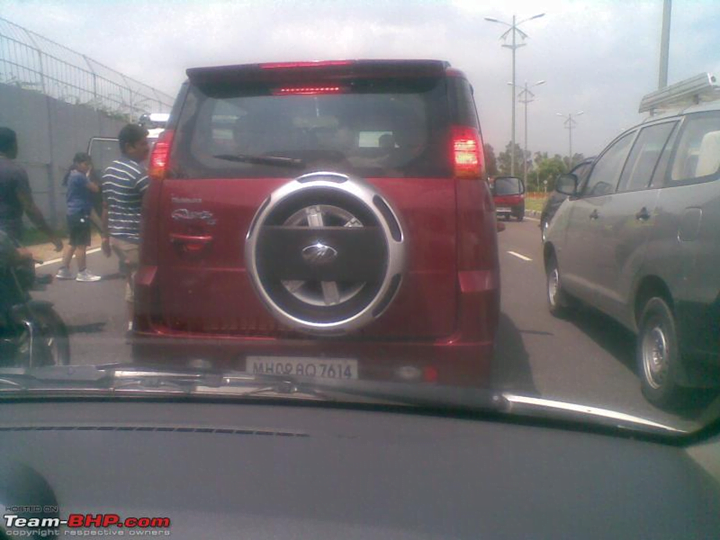 To help people distinguish it from the Xylo MPV, Mahindra has placed a spare wheel at the rear with a beautiful wheel cover with Mahindra logo in chrome. Coming to the features now, we are expecting the Quanto to offer dual airbags, ABS with EBD, alloy wheels (as in the image), steering mounted controls, Bluetooth connectivity, reverse parking sensors, height adjustable driver seat etc. As of today, the only cars that will give competition to Quanto are Duster and Ertiga, while EcoSport is to arrive in early 2013. The only important thing left to know is the pricing and if Mahindra prices it right, right enough to lure premium hatchback and entry level sedan buyers, it will be a smash hit and will put the sales chart on fire. 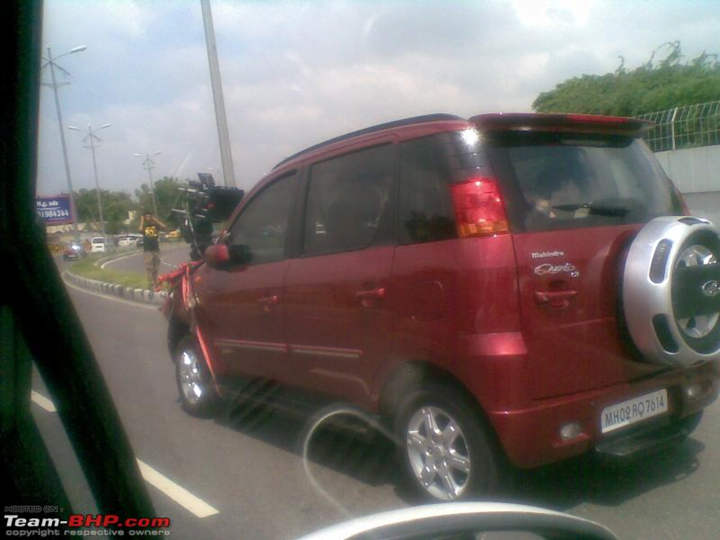 We will keep you posted on all the details of Mahindra Quanto, stay tuned to Car Blog India.